Joanne Berger-Sweeney was inaugurated as the 22nd president of Trinity College on October 26, 2014. 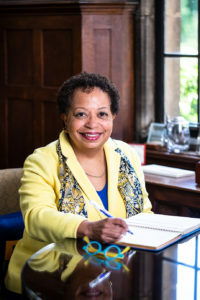 Since becoming president, she has overseen several major accomplishments, including the completion of the college’s strategic plan, Summit, which will guide Trinity toward its bicentennial in 2023 and beyond; the creation of the Bantam Network mentoring program for first-year students; the launch of the Campaign for Community, a campus initiative promoting inclusiveness and respect; and the expansion of Trinity’s footprint to Constitution Plaza in downtown Hartford. Additional achievements under Berger-Sweeney’s leadership also include the establishment of Trinity’s Task Force on the Prevention of Sexual Misconduct, the founding of the Center for Caribbean Studies at Trinity College, and the college’s thriving partnership with edX, one of the world’s premier online course platforms. Under Berger-Sweeney’s leadership, Trinity College is a key partner in the Hartford/East Hartford Innovation Places Planning Team selected in June 2017 to receive a share of $30 million in state funding to spark economic development and investment in innovation. Before coming to Trinity, Berger-Sweeney served as dean of the School of Arts and Sciences at Tufts University (2010-14), creating the vision and setting the strategic direction for the university’s largest school. She managed a broad set of responsibilities, including oversight of undergraduate admissions, athletics, undergraduate and graduate students, the graduate school, communications, and academic and administrative deans. Berger-Sweeney made significant strides in enhancing the strength of the school’s faculty and in expanding interdisciplinary programs, including the creation of the Center for Race and Democracy at Tufts, which studies the impact of race on the lives of individuals around the world. In addition, she was deeply involved in the creation of the Bridge to Liberal Arts Success at Tufts (BLAST) program, which aims to provide support for college students from underserved high schools. Before Tufts, Berger-Sweeney was a member of the Wellesley College faculty, which she joined in 1991 as an assistant professor in the Department of Biological Sciences, and rose through the ranks to become the Allene Lummis Russell Professor in Neuroscience. Her teaching and research career at Wellesley spanned 13 years prior to being named associate dean in 2004. In that role, she oversaw 20 academic departments and programs in addition to her teaching and research and led initiatives relating to faculty diversity, interdisciplinary programs, and non-tenure-track faculty. She also served as director of Wellesley’s Neuroscience Program. Berger-Sweeney received her undergraduate degree in psychobiology from Wellesley College and her M.P.H. in environmental health sciences from the University of California, Berkeley. While working on her Ph.D. in neurotoxicology from the Johns Hopkins School of Public Health, Berger-Sweeney did the proof of concept work on Razadyne, which went on to be the second-most-used Alzheimer’s drug in the world. She completed her postdoctoral training at the National Institute of Health (INSERM) in Paris, France. Berger-Sweeney has authored more than 60 scientific publications and has held grants from the National Institutes of Health, the National Science Foundation, and numerous private foundations. Berger-Sweeney serves on many boards in the Hartford region, including MetroHartford Alliance; Hartford HealthCare; the Connecticut Conference of Independent Colleges; the Hartford Consortium for Higher Education; and the Capital Region Development Authority, an appointment for which she was nominated by Connecticut Governor Dannel P. Malloy. She also is a board member of Cold Spring Harbor Laboratory, a private, not-for-profit lab in New York that has shaped contemporary biomedical research and education, and she serves on the board of AFS-USA, a leading intercultural education organization headquartered in New York City. She also is a corporator of Hartford Hospital and a fellow of the American Association for the Advancement of Science and the International Behavioral Neuroscience Society (IBNS), and she is a member of the Committee on Committees of the Society for Neuroscience. Berger-Sweeney has been a member of the Behavioral Neuroscience Review Panel of the National Science Foundation, the National Institutes of Health (NIH) Study Section panel, and the editorial board of Behavioral Neuroscience. Berger-Sweeney is the recipient of numerous awards. She is a fellow of the American Academy of Arts and Sciences and has been honored with a Lifetime Mentoring Award from the Society for Neuroscience (2006) and the National Science Foundation Young Investigator Award. Her husband, Urs V. Berger, Ph.D., is a neuroscientist and a computer scientist. They are the proud parents of two children. Read President Berger-Sweeney’s full C.V.